Wave pulses in a stretched string. Equations for a travelling wave. Linear media. Superposition. The limits of linearity. Reflections at fixed and free boundaries. Reflection and transmission at step changes in density. Describing the travelling sine wave. Comoving and fixed coordinates. y = sin (kx − ωt). Three dimensional plots. Phases in a travelling wave. Plucked vs bowed strings. Mode diagrams and harmonics. Harmonic tuning on guitars. Touch fourths and natural harmonics. Displacement, compression and pressure. Newton's second law and acceleration. The wave equation for sound. Speed of sound. Acoustic impedance. Reflection at open and closed ends. Mode diagrams for open-open and open-closed pipes. The harmonic series for flutes and clarinets. End effects. Real instruments and further complications. 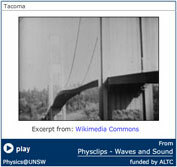 The stick-slip cycle and Helmholtz motion. String speed at different positions. Bow force limits. 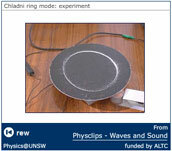 A web site introducing the physics of various instrument families, including the voice, and a range of related material.